Macho actor Gopichand joined forces with Sampath Nandi for a high voltage action entertainer. This morning, the makers unveiled the film’s first look poster along with its title. 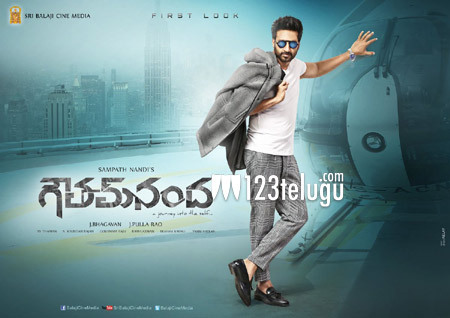 The film has been titled Gautham Nanda. Interestingly, Gautham Nanda is the screen name of Power Star Pawan Kalyan in his 2013 blockbuster, Atharintiki Dharedi. Sampath Nandi, who was supposed to direct Sardaar Gabbar Singh, is a huge admirer of the Power Star and looks like he showed his admiration in this manner. Gautham Nanda stars Hansika and Catherine Tresa as its heroines. The film has wrapped up more than fifty percent of its shooting. J Pullarao and J Bhagavan are jointly producing this movie and SS Thaman is scoring the film’s soundtrack.